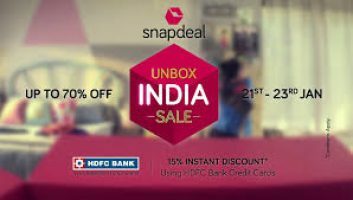 Snapdeal unbox india sale to start midnight today. One can hope to find unbelieveable deals on some of the hotselling products. Snapdeal unbox india sale begins today, with Hourly Deals on TVs, Appliances & Electronic devices (Jan 21st- Jan 23rd). During this sale event, they are offering 15% instant discount* with Hdfc Credit Cards. As like previous sales one can expect huge discounts in almost all categories. To icy this deal is the bank offer which will be an additional topping over the discounted price. But one should note that the bank offer will not be applicable on some products and categories. Note : Shipping charges applicable on selected products. Keep Visiting For More Updates & Offers.